UPDATE: We have updated the color shading measurement of the iPhone 6s after we found an error due to an invalid exposure lock during shooting in our lab. 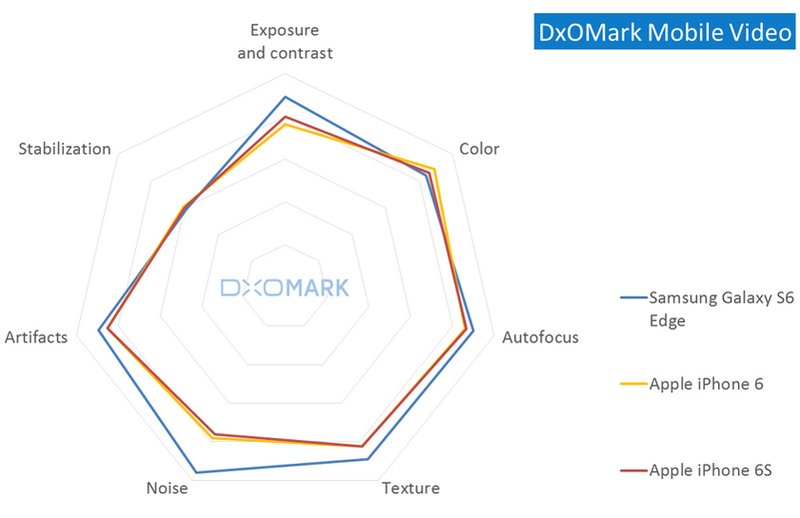 The review has been updated accordingly: the DxOMark Mobile Photo’s color score is improved by 2 points, while the DxOMark Mobile score remains the same. Apple’s various iPhone iterations have always impressed us with their photo and video performance, but with mobile devices from other established players firmly occupying the top slots in our database, let’s see how well the iPhone 6s performs. Although the latest iteration of the bestselling iPhone scores in many aspects almost identically to its predecessor, there is actually a lot that’s different on the inside. For a start, it has a new and more powerful A9 chip and 4.7-inch Retina HD (1334 x750 pixel) 326 ppi screen, now with the company’s intuitive pressure-sensitive Force Touch navigation. Furthermore, it is the launch-pad for the company’s latest and most advanced operating system to date, iOS 9. The recently available model retains the similar, slick aluminum chassis and has a new 5-Mpix higher res front facing camera (up from 1.2-Mpix). More relevant to our tests, as mobile photographers will be interested to hear, is that the rearward iSight camera has the same lens and field of view as the iPhone 6, but it features a new 12-Mpix, BSI 1/3”- type sensor, which Apple claims improves noise reduction over its predecessor. There’s still no room for optical stabilization in this model, but thanks to that new A9 processor the Cupertino juggernaut has upped resolution in video from HD to 4K (UHD) and added a new model option with a 128GB memory. The new iPhone 6s achieves very good individual scores for exposure and contrast, color rendering and flash, contributing to achieve a solid Mobile Photo score of 82 points. 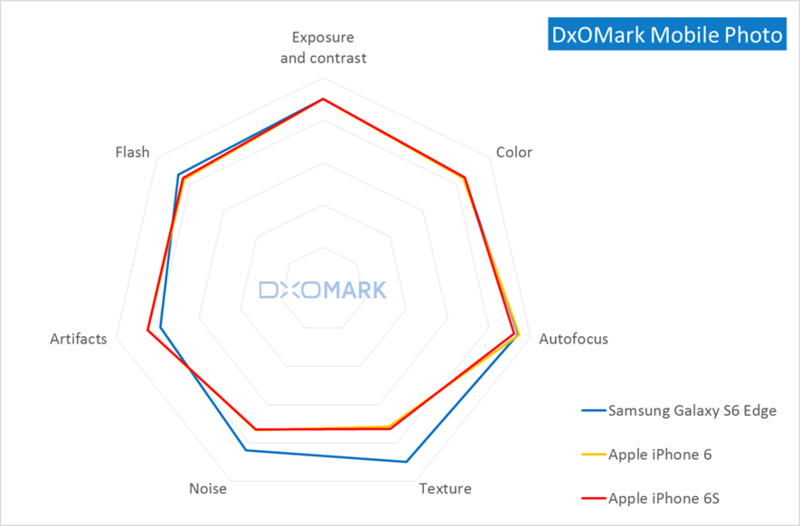 Overall results for Exposure and Contrast, Color and Autofocus match those of both the iPhone 6 and the Samsung Galaxy S6 Edge -the previous best performer in our Mobile database, which are two of strongest performers measured in those categories to date. From our tests, images are generally well-exposed and for the most part colors are vivid and pleasing outdoors. However, there are occasional differences in exposure noticeable between consecutive captures in very bright outdoor scenes, typically due to the inconsistent activation of the HDR mode. There is also a slight but consistent underexposure in extremely low light levels (5 lux); the result however is still quite usable and an improvement over the iPhone 6. White balance is reliable though inevitably some inaccuracies were noticeable at times, with a slight yellow cast visible in some outdoor scenes. Although this cast was present in captures from the iPhone 6 the cast was slightly stronger and more noticeable on the 6s. Autofocus was fast and generally accurate under our various test conditions. However, autofocus using the touch-to-focus mode, while generally good, is slightly less reliable than the iPhone 6 in our low light tests. Like the iPhone 6, the 6s has some noise visible in daylight over large expanses of uniform color such as blue skies and, as many of its competitors, across the frame in low light scenes. However, the luminance noise is finer grained and less visually obtrusive than its predecessor. Importantly, images retain good levels of detail outdoors in bright lighting and slightly improved on its forerunner, but –despite the extra pixels- in low light levels detail preservation is no different. In terms of artifacts, the iPhone’s camera generally performs quite well but occasionally shows some moiré on high-frequency patterns -such as fine fabrics and metal grills in cityscapes. We also observed some ghosting artifacts -as a consequence of the HDR activation- and some flare, though the lens isn’t shielded like some other mobile cameras. Lastly, the exposure with built-in flash was well-centered and accurate, with good detail and pleasing color, but images showed greatly reduced illumination in the corners and there was a slightly pink tint in images, resulting from white balance inaccuracies when mixed with tungsten lighting (at 20 lux). As for video, the iPhone 6s achieved a Mobile Video score of 80 points mirroring the score of the iPhone 6, and behind that of the Samsung Galaxy S6 Edge, which is better at keeping the noise in check while maintaining good texture preservation. The Samsung also achieved slightly better results for autofocus and exposure and contrast. Overall, the iPhone 6s captures good videos, with fast and accurate autofocus and good exposure accuracy, particularly in low light where it improves over the iPhone 6. Color shading is noticeable at times, particularly in low light conditions (on light colored, uniformly lit and flat backgrounds), where it has slightly stronger noise compared to the iPhone 6, particularly in the corners. Results for digital stabilization were similar to the iPhone 6 (and the Samsung), with it working well in good lighting but rather less efficient at reducing shake in low light where, arguably, it is needed more. 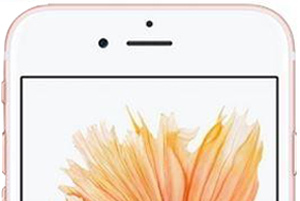 Despite our hopes for the new sensor, the Apple iPhone 6s posts an identical overall score as its predecessor. 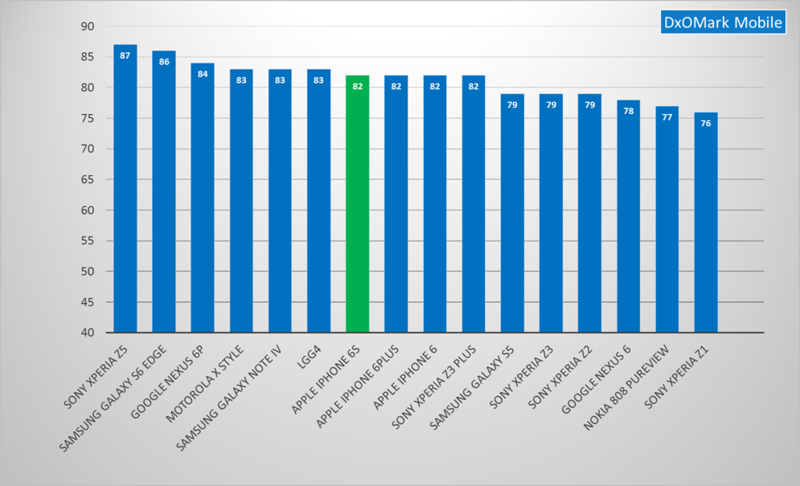 With an overall DxOMobile score of 82 points, the Apple iPhone 6s is left behind by the two leaders in our database, the Sony Xperia Z5 and Samsung Galaxy S6 Edge, with an overall score of 87 and 86 points respectively. Strong competition from rivals means that the Apple iPhone 6s actually moves down in our rankings. The Moto X Style and Google’s Nexus 6P bracket the 6s on performance, but are significantly cheaper to own. Apple’s technology is unable to keep noise at competitive levels; in fact, noise level is much higher than what can be found on the current leaders of our database. Detail preservation in bright light has slightly improved with respect to the iPhone 6, but the overall score remains low compared to the best in its class. The iPhone 6s performed well in our video assessment, with good results in exposure and autofocus accuracy, white balance reliability and color rendering. Strength and weakness are the same than the previous Apple iPhone 6. Overall, the Apple iPhone 6s continues to offer a good balance of performance and top-notch user experience, but those looking to upgrade from the iPhone 6 Plus might not find it appreciably compelling; however it’s likely that anyone with an earlier model will be lining up. - Very good exposure overall. - Fast and generally accurate autofocus in all test conditions. - Reliable and pleasant white balance in most conditions. - Good detail preservation in bright light. - Fast, accurate and smooth autofocus in all conditions. - Good overall exposure and white balance. - Some luminance noise visible, especially in low light. - Slightly yellow cast visible in outdoor conditions. - Occasional ghosting and other artifacts. - Noise noticeable in low light conditions, especially in image corners. - Slight color shading visible in low light conditions.